Start by making the blackberry lemon swirl: combine blackberries, sugar, lemon juice and zest in a small nonreactive saucepan. In a small bowl, whisk together the water and cornstarch and add to the saucepan. Cook over medium heat, stirring occasionally, until it comes to a boil and thickens – while you stir, break the blackberries with a fork so they dissolve into the jam. Now, the cheesecake ice cream: in the bowl of an electric mixer, beat together the cream cheese and sugar until fluffy and smooth. Add the egg and vanilla, mix until creamy and set aside. Bring the milk to a boil over medium-low heat. Remove from the heat and add ¼ cup of the milk to the cream cheese mixture and mix until combined and smooth. Continue with 2 more quarter cups of milk and then add the entire mixture back to the pan with the rest of the milk. Stir over medium-low heat until thickened slightly (should take around 3 minutes). Remove from heat, strain mixture and cool for 10 minutes. Combine the zest, heavy cream and cream cheese mixture together then refrigerate for 1 hour. Pour into your ice cream machine and freeze according to manufactures instructions. 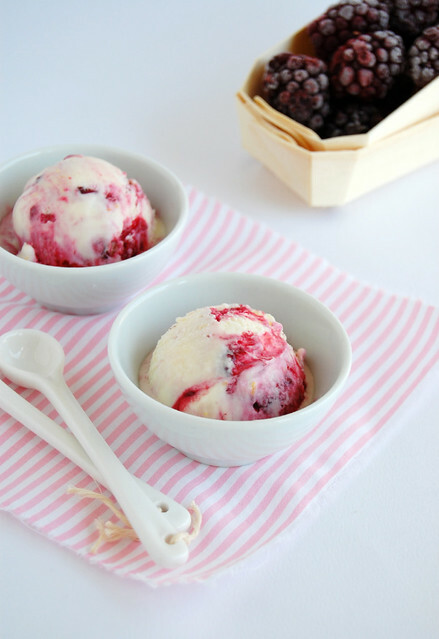 When ice cream is thickened and finished freezing, slowly pour in the blackberry lemon syrup and let ‘swirl’ a few times in the machine before turning off - you can also do this by creating layers of the ice cream to a container and adding the syrup between layers , then swirl with a knife a few times. oh my oh my!! this looks sooooo good. and I'm also intrigued by your apple and passionfruit crumble. Must try it soon! I have a friend growing passionfruits, and I'm hoping she shares some with me, because passionfruits are almost non-existent here. Hi Patricia, I haven't been here in ages and I see you have been baking some wonderful things. I'm totally in Ice cream phase right now and this recipe sounds just perfect. Your photos are stunning as always. Omg, wat a gorgeous looking dessert.. It's so pretty! 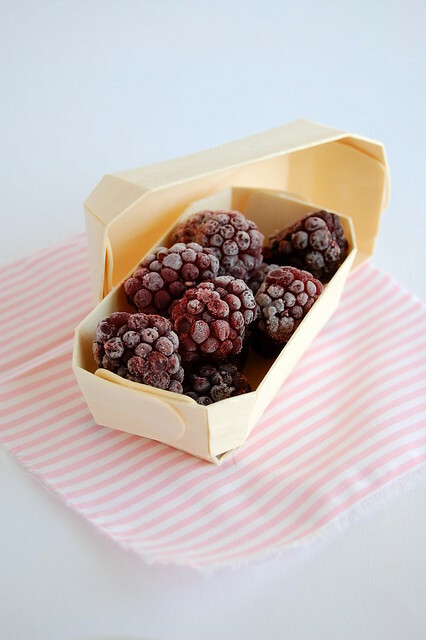 And I love that photo of the frozen berries. Oh Patricia, how did you know the way directly to my heart? I've been going gaga over cheesecake ice cream since college. My best girlfriends and I would finish a pint in 10 minutes flat hehe. Cheesecake ice cream is one of my favourites! Yours looks beautiful! This is perfect for the weather here in Israel - 30 degrees celsius everyday. Can't wait to try it. the ice cream is great treat during hot weather! beaautifully whipped icecream!....i too have some blackberries siting in the freezer...all set up for winter..
Ahhh, gorgeous! I can almost taste it--and I just know it's amazing. Oh yumm. This is such a great idea. Who doesnt like cheesecake, and in an ice cream,,,, even better. I am so making this soon. Before winter truely hits the UK! Hi Patricia, Thanks for sharing such a great recipe. I'm looking for ice cream recipe with less yolk and this will be great to use. Bella, thank you for stopping by! I will! Susan, I bet your family will like this, sweetie! Shaheen, thank you! I hope you try that crumble, it is really good! Hope you give it a try before summer ends! Xiaolu, you are far too sweet! I wish I could have you over so we could share this ice cream, darling! Chelle, thank you for stopping by! The Unappreciated Baker, I do hope you try it! Shabs, thank you! Hope you give this a go. Zoe, thank you for stopping by! I hope your family like this ice cream! Meredith, thank you for visiting! I'll check your blog, too! Ooooh, it's blueberry season here, and there's nothing better than ice cream and cheesecake. I know what I'm going to spend the evening doing!